1. To legband a minimum of 1,500 geese in order to create a marked population of AP geese from representative portions of the breeding range. Recoveries of these marked birds are used to estimate adult and juvenile survival, harvest rate, timing and distribution of the harvest. 2. To check the fate of 144 Canada goose nests from 5 study sites. A field crew led by Dr. Austin Reed of the Canadian Wildlife Service had found these nests between June 4-9. The objective of the nesting study is to annually measure the reproductive success of these birds and identify factors contributing to nest loss. Two additional crews were working simultaneously near Puvirnituq, near the eastern shore of Hudson Bay, also banding AP geese and checking the fate of nests. These crews were led by Jack Hughes and Kevin Jacobs, wildlife biologists with the Canadian Wildlife Service and Pennsylvania Game Commission, respectively. These field studies were initiated in 1997 following a precipitous decline in AP geese. This decline culminated in a sport hunting season closure for Canada geese in parts of the US and Canada in 1995. Prior to 1997, the status of AP geese was measured with banding and other surveys on the wintering grounds in the United States. Prior to the mid-1980s, when resident population Canada geese were less abundant, wintering ground surveys were reasonably accurate in determining the status of AP geese. However, with the tremendous increase of resident geese after 1985 and their inherent mixing with AP geese on the wintering grounds, it became necessary to begin monitoring the status of AP geese directly on their Arctic breeding grounds. Of course, the disadvantage of working in the Arctic is the expense. Management agencies, however, have deemed this expense justified given the tremendous value of this migratory wildlife resource. These studies are funded primarily by the Atlantic Flyway Council which is comprised of the 17 Atlantic coast states (including New Jersey) and 7 eastern Canadian provinces. Other partners in these studies include the Canadian Wildlife Service, the US Fish and Wildlife Service, Makivik Corporation of northern Quebec and the Nunavik Hunting, Fishing and Trapping Association (HFTA). The Nunavik HFTA is comprised of representatives from the 15 Inuit communities in northern Quebec. Nunavik, which means "the land" in Inuktitut, the native language of the Inuit, comprises all the land north of the 55th parallel in northern Quebec. In addition to myself, our crew included Joe Garris, wildlife technician, also with the NJ Division of Fish and Wildlife, Arnaud Bechet, graduate student at the University of Quebec at Montreal, and Sandy Suppa, wildlife technician with the Makivik Corporation in Kuujjuaq (pronounced ku-jew-ak). Makivik fisheries biologist Geoff Kline assisted on several days when Sandy Suppa was not available. We used an ASTAR 350D helicopter piloted by Peter Duncan of Nunavik Rotors, which is based in Kuujjuaq. Living in Kuujjuaq all his life, Peter's knowledge of the landscape proved invaluable. We worked daily by helicopter out of Kuujjuaq (formerly Fort Chimo), the largest village in Nunavik. Kuujjuaq, which means "Great River", is located on the Koksoak River, about 20 miles upstream from the southern shore of Ungava Bay. The population in Kuujjuaq numbers about 2,300 and is largely Inuit, although there are also a considerable number of descendents from transplanted French-speaking and English-speaking whites. The Hudson Bay Trading Company established its first outpost in northern Quebec in the area about 1830. In addition, the US military built a large airstrip on the bank of the Koksoak River during World War II. Fort Chimo was used by the US military as a staging area for trans-Atlantic flights during the war. The first thing I learned from being in Kuujjuaq was the disadvantage of not being bilingual. Nearly everyone in Kuujjuaq is fluent in Inuktitut and English or French and English. The timing of our banding coincided with the annual wing-feather molt of the adult geese. All adult waterfowl, including Canada geese, undergo this molt which renders them flightless for a period of 3-4 weeks each year. In addition, goslings had not yet attained flight. The actual capture process went something like this: We flew preferred Canada goose habitats, particularly salt sedge and freshwater cottongrass meadows, searching for brood flocks (flocks with goslings). When we saw a flock that we wished to capture, we would drop someone off, usually Arnaud Bechet, as he was the youngest and most fleet of foot. Arnaud would essentially cut-off the geese from any escape routes while we leap-frogged with the helicopter over the flock to a dry capture site. With the helicopter running, we would unload the capture equipment. Peter Duncan would then leave us and leap-frog the helicopter back over the brood flock, thereby containing the flock between Arnaud, the running helicopter and us at the capture site. We (usually Joe Garris, Sandy Suppa and I) would erect a circular capture pen that consisted of 4-foot high nylon netting attached to poles. We then attached 35-foot "wings", also made of 4-foot high netting on poles, to the entrance of the capture pen, in essence creating a corral with a funnel. 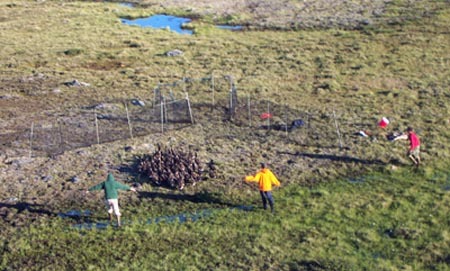 Sounds easy, but setting up these nets in often rocky and sometimes permafrost ground can be strenuous and frustrating. After setting up the nets we called Peter on the radio, who with the helicopter and the help of Arnaud on foot (this is where the fleet of foot was advantageous), began to move the birds toward the capture site. Once the geese were within about 75 yards of the capture nets, the 4 of us on foot usually pushed the flock the remainder of the way into the nets. The whole scene is rather reminiscent of a rodeo, but with a helicopter instead of horses. Once the birds were secure in the pen, we fashioned 2 additional pens out of the wings to have a total of 3 circular pens. We would then separate the goslings from the adults to minimize the risk of trampling as captured geese will pile into a small area of the pen to get as far away from the banders as possible. To reduce stress on the captured geese, we banded each bird as quickly as possible and when all birds were banded, released the flock in unison. Previous and ongoing studies have documented that Canada geese from other populations, including resident population geese from the United States, will migrate great distances during May/June to molt their flight feathers. We strove to ensure that our banded sample of geese would be truly representative of locally breeding AP geese and not "contaminated" with these molt migrants. To avoid molt migrants, all of our captured flocks contained goslings. Obviously, flocks with goslings have a higher probability of containing locally breeding adult geese. And of course, since the goslings have yet to attain flight, they are assuredly locally hatched birds. Unlike 2000, when we had sunny weather with comfortable temperatures almost every day, 2001 dealt us a weather season with considerable frustration. Such is life in the Arctic. On July 31, our first day in the field, we were met with sunny, humid conditions, much like New Jersey. By noon, the temperature had risen to a sweltering 88 degrees. The heat was clearly placing a great deal of stress on captured birds so we instead decided to check the fate of goose nests in a nearby study area. By the next day, the weather had cooled off substantially and we had more typical Kuujjuaq temperatures (60-70 degrees) for the remaining part of our trip. We were, however, grounded for one entire day and significant parts of the last 5 days due to fog, drizzle and rain. On August 8, I called my wife to learn that the temperature in New Jersey was 100 degrees. I almost felt guilty telling her that it was a relatively pleasant (although raining) 45 degrees in Kuujjuaq. On August 10, the final day of our helicopter contract, fog grounded us until 11:30 AM. To make up for lost time on that day, and from the previous 4 days, we banded geese all day and returned to the airport at dusk (9:30 PM). We were one tired but happy crew since this was our best day with 523 geese banded. It was a classic case of achievement at the "11th hour." For the duration of our stay (July 31-August 10) we banded a total of 2,513 Canada geese, including 1,592 goslings and 921 adult geese. From 1997 to 2000, our yearly bandings ranged from 1,929 to 2,239 geese, so 2001 was our best year yet. A total of 43 captures were made for an average of 58 geese trapped per capture. Our captures ranged from a low of 8 geese (we started with 25 geese in this flock but lost most of them in the brush) to a high of 160 geese. An additional 34 adult geese which were previously banded were recaptured. Interestingly, these recaptures included one bird with a neckband that was banded during February 1993 in Maryland. The geographic coverage of our banded sample of geese spanned about 180 miles of tundra and boreal forest within 20 miles of the western and southern shores of Ungava Bay. The 2 crews operating near Puvirnituq banded a total of 6,035 geese. Totaled with our work near Kuujjuaq, a total of 8,548 geese were banded on the Ungava Peninsula of northern Quebec during 2001. This work adequately addressed the annual banding goals of the Atlantic Flyway Council's Atlantic Population Canada Goose Management Plan for 2001. These bandings will play a key role in evaluating the effects of hunting seasons on AP Canada geese. During 2001, nest success, defined as at least one egg hatching per nest, could probably be best described as mediocre in the Ungava Bay area. Preliminary nest success from 4 of the long-term study areas averaged about 50%. In past years, nest success at some of these sites was as high as 85%. 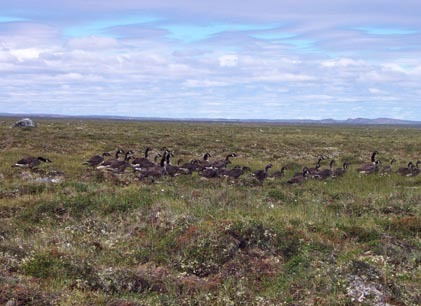 Similar to 2000, and based on observations of brood flocks, nest success appeared to be poorer to the east of Kuujjuaq, near the edge of the boreal forest. To the north of Kuujjuaq, particularly north of Leaf River, gosling production was good to excellent. One new nest area study site, about 70 miles east of Kuujjuaq near George River, had complete nest failure primarily due to nest predation by black bears. Although there was some variation in gosling ages during 2001 near Ungava Bay, plumage characteristics of goslings captured during banding suggest that most goslings hatched between June 15-20, about 10 days earlier than average. Further west, near the Hudson Bay coast, nest success was much higher at about 80%. Similar to Ungava Bay, the chronology of the nesting season was much earlier than average due to early snowmelt. 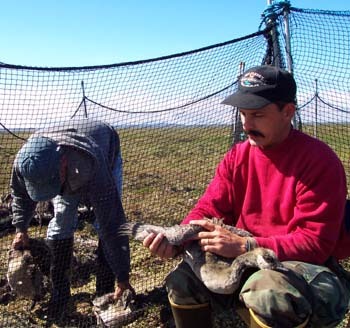 Kevin Jacobs, Pennsylvania Game Commission wildlife biologist and field crew leader near Puvirnituq, described 2001 as, "The tundra was full of brood flocks. Breeding conditions were as good as it gets for AP geese along Hudson Bay". Besides Canada geese, sightings of other wildlife kept the trip interesting. Perhaps most interesting was eight sightings of timber wolves totaling nine individuals. In one case, we encountered a wolf that appeared to be stalking a flock of geese that we intended to capture for banding. We had to chase the wolf away with the helicopter before we could begin our work. The wolf was stubborn about leaving as we had apparently disrupted his plans for lunch. Arnaud Bechet and Joe Garris sighted another wolf while checking nests. 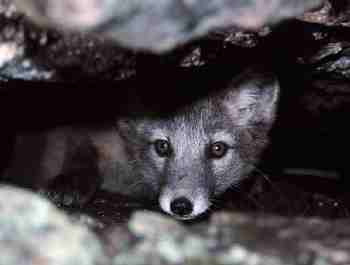 The wolf circled downwind about 150 yards from their position and howled while they worked. Black bears were common, particularly in salt marshes where they were observed grazing on salt sedges. Musk ox were abundant on the tundra north of Kuujjuaq and caribou were seen intermittently, particularly east of Kuujjuaq near the boreal forest. We saw several golden eagles, and the highlight on one day was a pair of parasitic jaegars chasing a fledgling gyrfalcon. On August 1, while returning from a day of banding and nest checks, we saw two beluga whales in the Koksoak River, just a mile or so from town. We also observed several broods of long-tailed ducks (formerly called oldsquaw), pintails, common eiders, green-winged teal and red-throated loons. Although very few black ducks breed as far north as Ungava Bay, molting drakes were very abundant in coastal ponds. Rough-legged hawks were very common and several times Peter Duncan had to maneuver the helicopter to avoid colliding with flushing rough-legs. Joe Garris had one sighting of a snowy owl that the rest of us missed. We wish to thank the Makivik Corporation which supplied critical logistical support as well as field personnel. The Quebec Department of Wildlife and Parks graciously provided an apartment for our crew during our stay in Kuujjuaq. We thank Peter Duncan and the engineers of Nunavik Rotors for a safe and productive field season. The Wildlife Management Institute facilitated financial administration of travel and other expenses. Finally, I wish to thank our Director, Bob McDowell, for allowing agency personnel Joe Garris and I to participate in this work.